Montorgueil is in the 2nd arrondissement and is made up of narrow streets, almost all off-limits to traffic. From these you can glance up into the mediaeval buildings and get a glimpse of the centuries-old wooden ceilings. It is mainly a bourgeoise residential area inhabited by young couples with children. 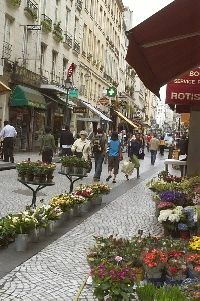 Take a stroll down Rue Montorgueil with its mix of perfumes from the open-air fruit and flower markets. The neighbourhood offers a vast choice of small restaurants and bars: some romantic, some specialising in different types of cuisine, some just simply trendy bars for a late afternoon appetizer. All kinds of shops make this an interesting neighbourhood. Everything is within walking-distance, supermarkets, fisheries, butchers, vintage and trendy clothing stores. It lacks trees but the window boxes make it a colourful area. Theres good public transport, with two metro lines that cross Paris in both directions and the RER B line which takes you directly to both Charles de Gaulles and Orly airports.